Welcome to the E6440 Owner's Lounge! A place to share tips/tricks/mods with other owners get the most satisfying user experience from this exceptional notebook. socketted CPU allows a easy user upgrade up to a 37W/47W i7-quad, doubling i5/i7 dual-core CPU performance. The result of doing so being one of the smallest most powerful Haswell systems available that can function as a desktop replacement. 1920x1080 eDP LCD option in latest E6440 to give more viewable content than the typically 1366x768. Series-1 systemboards being dual-LVDs equipped capable of 1600x900. AMD HD8690M dGPU option, similar performance to a GT730M/GT640M and faster than the HD4600 iGPU. These have a beefier heatsink. rare 5Gbps expresscard slot allows implementing a ~$160 GTX560Ti@x1.2Opt DIY eGPU for gaming graphics, CUDA/OpenCL processing or driving more external LCDs. E6440 systems specced without an expresscard slot can retrofit one at low cost. mSATA (SATA-III) slot - can add a small and fast mSATA SSD to host your OS/programs. Then can use a larger internal HDD for storage. optical drive can be swapped with a second 2.5" 9.5mm SATA-III 6Gbps SSD or HDD in a caddy & in a JBOD, RAID-0 (performance) or RAID-1 (redundancy) configuration. Can have up to 5TB of internal HDD storage (2x2TB 9.5mm HDDs + 1TB mSATA SSD). Or RAID-0 2xSSDs for superfast boot-times and > 1GB/s sequential transfers. upgradeable WLAN : non-whitelisted bios allows upgrading to 802.11AC WLAN with a Broadcom BCM4352 or Intel 7260 HMW card. Dell's E6440: Driver's link, Manuals link and Upgrade parts link. Windows 7 Dell OEM Source : Includes additional Dell installation content needed for a fully licensed Win7 clean install. Dell warranty checker: useful to check an ebay secondhand unit's remaining warranty. Ask vendor for the Support Tag. Can effectively double the CPU performance going from a factory i5/i7 dual core to a i7-quad CPU. Note: warranty implications of a CPU upgrade - a factory-specced faster dual core up to i7-4610M will not void warranty while a i7-quad will void the warranty if Dell know about it as it wasn't offered with one. I'd keep the original CPU back and swap it back in if necessary. Upgraded E6440 i7-quad system examples are shown in the table above. One important consideration is whether to get a 37W i7-4702MQ (4-core turbo=2.9Ghz)to keep within the factory-configured CPU's TDP or get a faster and hotter 47W i7-4800QM/i7-4700MQ (4-core turbo=3.5/3.2Ghz). I'm of the opinion that the 37W one should be avoided. That's because (1) the 47W CPUs can be software limited to 37W (2) XTU/Throttlestop allows a negative offset voltage offset to be applied bringing TDP down and allowing higher multipliers to work and (3) the beefier dGPU-model heatsink that can handle the higher TDP and can be retrofitted to the iGPU-only model. The E6440 BIOS locks the TDP but allows extra turbo bins are accessible using either Throttlestop or XTU. Eg: a i7-4700MQ has +200Mhz unlocked turbo bins (max=3.4Ghz 4-core). A i7-4800MQ has +400Mhz unlocked turbo bins (max=3.9Gbz 4-core). Problem with the 47W TDP limit is it limits performance to 3.5Ghz during a TS 32M/1024M 4-core load test. That result being *after* voltage optimization in XTU/Throttlestop. Meaning then that max performance lies between a turbo unlocked i7-4700MQ (3.4Ghz) and i7-4800MQ (3.9Ghz). Eg: a i7-4710MQ (3.5Ghz 4-core) would be at max TDP limits. Though those newer CPUs are rarer and often pricer than a faster i7-4800MQ. Means then that for the majority of users, a i7-4800MQ gives an easy plug'n'play installation from which highest performance, within TDP and thermal limits, can then be extracted easily using Throttlestop or XTU. An eGPU has been implemented on a E6440 using a NVidia GTX770 (Tech Inferno Fan), AMD R9 280X (Tech Inferno Fan). DIY eGPU: attach a desktop videocard via the E6440's 5Gbps expresscard slot. Provides accelerated gaming graphics, CUDA/OpenCL processing and additional HDMI/DVI outputs to drive multiple monitors. A NVidia or AMD card is a straight plug-n-play implementation on a E6440. The system must boot least once with the eGPU attached and detected by the BIOS. This lowers TOLUD from 3.49GB to 3.24GB, storing it in NVRAM thereafter. Both my GTX770 and R9 280x can then be allocated without any error 12. In addition, no PCI Reset Delay mechanism is unnecessary and is best to be disabled. Then the system and eGPU can support a sleep-resume cycle with eGPU activate on resume. NOTE: The A.02 BIOS handles the eGPU beautifully, running a Gen2 expresscard link. Unfortunately bios A.05 or newer sets the EC port to Gen1 speed if you hotplug the eGPU after BIOS boot (see details). Flash back to A.02 to get the faster Gen2 link speed OR disable any PCI Reset Delay mechanisms on the eGPU adapter so the BIOS sees the eGPU on boot. Note: E6440 iGPU-model can boot with powered eGPU powered plugged into EC slot. dGPU-model E6440 will not boot with powered eGPU plugged into EC slot and so requires hotplugging after boot. -port5 = enabled but with no device attached. Maybe the LAN card? If want to experiment with a x2 2.0 eGPU implementation then suggest look at a one-gen older Dell E6430. It's has two mPCIe ports (port 1 + 2) as per the E6430 schematic. Funny thing there's no camera connector on motherboard with EDP. NOTE: The Intel iGPU Control panel mistakenly lists the LCD as being eDP as explained in the series-1 E6440. My system came from the factory with a 900P AUO B140RTN02.2 panel with Dell p/n 0M4RTT. I find brightness and viewing angles quite satisfactory. 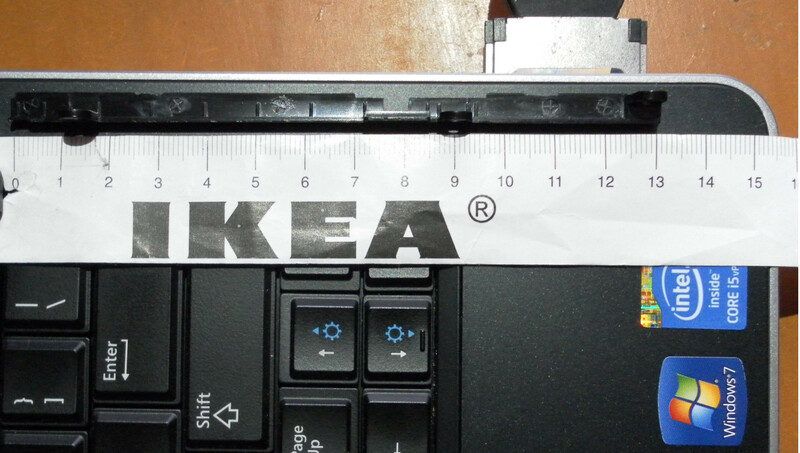 A photo of my 900P LCD's model labelling is in the spoiler below. 1080P or higher resolution : not possible since the E6440 uses a LVDS rather than eDP internal LCD interface. The max resolution available in 14" LVDS is usually 1600x900, representing 37% more viewing area than 1366x768. Though ebay has 14" 1680x945 LVDS LCDs, giving an additional 10% more viewing area over 1600x900 or 51% over 1366x768. --> 1680x945 LCD does not fit correctly as attempted here. INFO: dGPU_heatsink - improve iGPU model cooling by retrofitting dGPU model heatsink+fan. Useful if see i7-quad thermal throttling under full 4-core load. RAID_unlock: Enabling E6440's hidden RAID BIOS options (Atonus) giving RAID-0/1 and maybe RAID-5 as discussed. I present you a tool to decompress Dell UEFI BIOS (JimboBobB@MDL) - extract the raw E6440 BIOS file from Dell's distribution EXE. Confirmed works. A workaround to the depreciated "-writehdr" option. 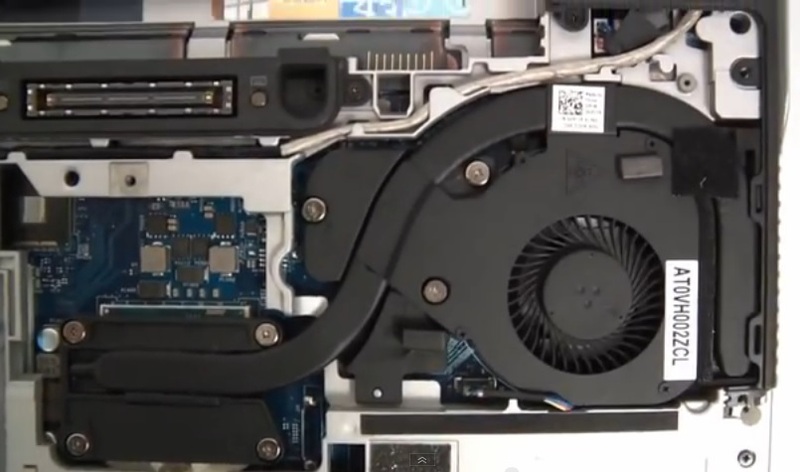 When looking under the optical drive of my system without the factory EC slot I could see the cavity for the EC slot as well as the systemboard connector for the EC board. Only functional things missing are the EC board and cage. 1. C7XN3 (PWA DTRBD EXPRESS E6440) . Note 2 screws required to affix this to the systemboard. One can be obtained from workaround (3) below which is enough to get by with. 3. Expresscard version WLAN switch faceplate that sits above the optical drive. This shorter version allows expresscard insertion. If you want to save money then just shorten your existing plastic plate using a dremel or coping saw. To remove your existing faceplate, remove the optical drive and undo the 3 screws holding it down. Since the portion you'll be cutting has a screwhole, one screw is freed and can be used in (1) above. The cut would be somewhere between 93-95mm from the left edge to align with the expresscard slot edge as shown in the spoiler. Maybe someone with a factory EC model can measure theirs precisely? 4. JK0C0, INSR BLNK EXPRESS E6440: The usual full length 34mm expresscard blanks are ~15mm too long. It needs to be the Dell E6440 specific one. Or you can skip using this and just have an empty space there. 3. Latitude E6440: Express card cage disassembly. Also explained with pictures E6440: Removing the ExpressCard Cage. Do not go dGPUless just for heat reasons if you get a quad core. 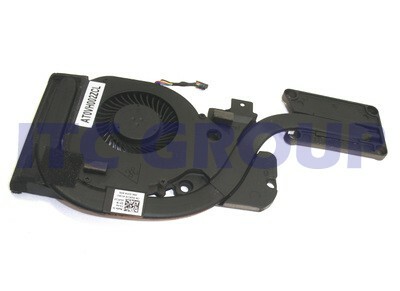 For the E6520 Dell would put in thicker heatpipes and faster fans if you got a dGPU and quad core. They probably do the same thing on the later series. no dgpu + dual core = 6mm heatpipe + 3.1cfm fan. no dgpu + quad core = 8mm heatpipe + 3.1cfm fan. dgpu + dual core = 6mm heatpipe + 3.1cfm fan. dgpu + quad core = 8mm heatpipe + 5.0cfm fan. The top end quad + dgpu config had the best cooling hands down. If still concerned over heat, just don't use the dgpu and you'll have very good cpu cooling. NOTE: This is a bust!! 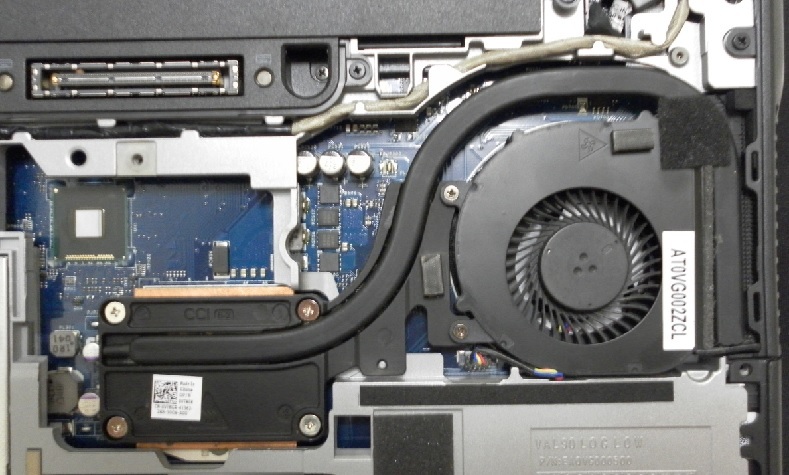 The dGPU-model heatsink cannot be retrofitted to a iGPU-model system due to having heatsink CPU screw mount point offset location slightly more to the right. Attempting to do so results in the heatsink protruding from the right side of the system as found at http://forum.techinferno.com/dell-latitude-vostro-precision/6980-14-dell-latitude-e6440-owners-lounge-8.html#post120586 . Thank you for the heads up. Just did a quick google search to identifying the dGPU heatsink. Found it! The dGPU one is significantly better than the iGPU-only model. Fan is bigger and heatpipe is noticeably wider. So yeah.. can get the dGPU model and just not use the dGPU. Or could get the iGPU model and retrofit the dGPU model heatsink. To retrofit, we see below the heatsink mid section top left corner that sits over the dGPU would need to be dremelled. That's because the iGPU model has 3 tall capacitors there. After being modified like it appears would be a straight drop in replacement. 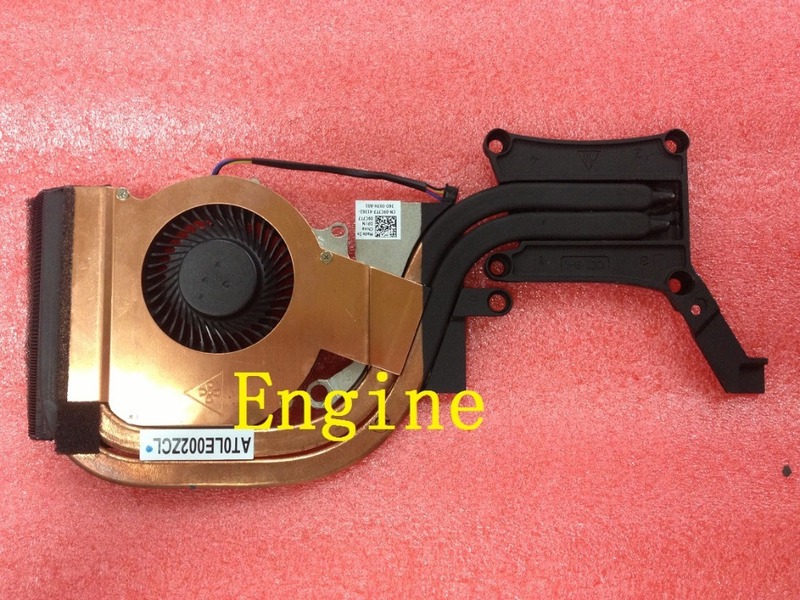 Above: E6430 heatsink for dGPU model p/n 09C7T7. It looks even better but it's unlikely to be such a straightforward fit. In addition to the dual heatpipes, it layers a copper sheet across the fan to give a secondary heat path to the radiator/fan assembly. It also has a small on the CPU heatsink to cool the I/O chipset. <-- Khenglish suggests below the E6430 heatsink would require extensive modification to fit. Also look into the E6430 heatsinks. They may be identical but for half the price off of ebay. @Tech Inferno Fan it looks like the e6430 and e6440 heatsinks do not quite match. The e6440 cpu contact area looks slightly "higher" to me, and the lower right screw hole is definitely different. It could probably be made to work with a dremel though. I got a e6520 heatsink to fit an e6530 motherboard with a lot of work. I would just go with the e6440 heatsink though unless you are willing to spend hours on dremel and possibly oven work to move contact plates. [url]http://forum.techinferno.com/general-notebook-discussions/2091-lets-enable-overclocking-all-6-7-series-laptops.html#post26529[/url] : is a how-to guide to do ~5% BCLK overclock using XTU. A process useful to 37W i5/i7 CPUs as well as the lowest end i7-quad, the i7-4700MQ to maximize their performance. i7-4800MQ i7-quads become TDP limited to x35 and can't even use their higher unlocked multipliers. Those CPUs have no need for BCLK overclocking. A i7-4710MQ, with it's x35 unlocked 4-core multipler, runs at the bios/chassis limits of a E6440. It would be a great one to get but it's scarcity often sees it costing more than a higher performing i7-4800MQ. Khenglish advised as quoted below, and I confirmed that the highest BCLK overclock on a Haswell Dell was in the ~2% range. I managed 2.5% and that was horribly unreliable. It required small 0.200Mhz increments and more often than not would freeze the system at say 101Mhz. Note that this is with the ALL clock outputs enabled modified ME FW. There is scope still to get better a better overclock in the 4% range with a modified MW FW with *guessed* clock outputs. There was too high of a risk there of bricking my box so I didn't pursue that further. Others willing to try are advised to contact Khenglish to organize a candidate modified ME FW to flash. Unlocking BCLK is different on haswell than SB and IVB. Typically users can only overclock a measly 2%, with 4% at the absolute best. With BCLK mods an extra clock source is enabled. On Haswell the output of this source is hardware specific, and thus modders do not know which specific clock output must be enabled. All could be enabled, but this hurts the BCLK overclock. If I try only one at a time at the clock output and guess wrong, the system will be bricked unless the watchdog detects the ME FW failure and loads failsafes. I did do this once and the watchdog did prevent a brick, but I don't know if it is reliable for all laptops. I think I will probably guess right the first time (ME FW Prema and I looked at have always had the lowest numbered disabled clock output as the one that must be enabled), but it's no guarantee. 1. Enable all clock outputs. Expected overclock between .5% and 2%. Will definitely work. 2. Guess at clock output. Expected overclock between 1.5% and 4%. Small chance at brick. To do a BCLK overclocking requires unlocking the flash descriptor, taking a ME firmware dump using the Series-8 specific pure DOS/FreeDOS version of fpt.exe available here, modifying it using the Intel toolkit, flashing the modified ME firmware and then using XTU to do the BCLK overclock. Khenglish has done the ME firmware mod for us taking much of the technical complexity away from the process. In this post we look at how to unlock the flash descriptor and flash Khenglish' modified ME FW. There are two methods that can be used. The first is a temporary unlock, the second requires the first and then permanently unlocks the flash descriptor to allow unlimited bios modification. 1) Temporarily unlock the flash descriptor by pinmodding the HDA_SDO signal on the Realtek ALC3226 audio chip. Reviewing the Inspiron 15 schematic, using a similar ALC3221 48pin chip, shows SDATA_OUT (HDA_SD0) is pin 5. After removing the palmrest, I did bridge pin1+5 as shown the spoiler. That did successfully unlock the flash descriptor. NOTE: There are two sideeffects of doing this: (1) no audio out from the internal soundcontroller and (2) BCLK slider did not appear at all. Seems to kill the ME completely if the flash descriptor is unlocked. Therefore you'd only do this bridging temporarily to grab a bios dump, modify it, flash it back. That temporary process can be accomplished by merely bridging those two points on bootup with say a paperclip to unlock the flash descriptor. References used: [url]http://forum.techinferno.com/general-notebook-discussions/2091-lets-enable-overclocking-all-6-7-series-laptops-24.html#post84052[/url] and [url=http://forum.notebookreview.com/dell-xps-studio-xps/635536-l502x-modded-bioses-download-gpu-voltages-more-263.html#post9555220]L502X modded bioses download (GPU voltages and more!) - Page 263[/url]. 2) One your flash descriptor is unlocked, modify your BIOS dump with the unlocked flash descriptor mod, then flash it. That then unlocks the flash descriptor permanently without needing a pinmod. [url=http://forum.notebookreview.com/dell-xps-studio-xps/635536-l502x-modded-bioses-download-gpu-voltages-more.html]L502X modded bioses download (GPU voltages and more! )[/url] explains how to do it. I've confirmed the "00 00 0B 0A 00 00 0D 0C 18 01 08" string exists at the start of the E6440 bios dump. then save the file. this will unlock the descriptor. once you get the descriptor patched and flashed back at the chip, put the chip back into the motherboard with the socket or solder it directly if you dont have sockets installed. if your machine boot without issues, you can continue and proceed to enable OC. Nando4>> Am awaiting a reply to my last PM showing the E6440 "signed firmware" bios setting and your take on whether that would still allow the modified bios with flash descriptor protection removed to boot. My machine is a disassembled mess pending your reply. Sorry, got distracted. Yes the E6530 says that message too, but works fine with an unlocked descriptor. Now here's the problem. Dell never disabled any clock outputs. With Haswell's track record this means you will have a 2% overclock at best. Some are definitely unused and thus could be disabled, but we have no idea what those are besides disabling them and seeing what happens. Download the Series-8 FPT here: fpt-s8.rar. FPT needs to be run from DOS. There is a windows version but flashing in windows is very dangerous. Nando4>> Now I went to flash it but got a size mismatch error. The ME file provided is just under 5MB, yet the target is over 6MB. Is it safe to say yes and proceed? It's smaller because I pulled the padding. This happens when I pull the ME FW out of the firmware image. This flashes fine. Nando4>> Confirmed, the ME flashed fine, system rebooted and BCLK slider in XTU was now unlocked. Shutdown the system completely and reboot. The three screws on the dGPU-model heatsink in the mid section are for the dGPU. At least the left middle part (left of the docking connector) would need to be dremelled off because the iGPU-model has some tall caps there instead. The iGPU-model heatsink is simply secured down with the 4 screws over the CPU. 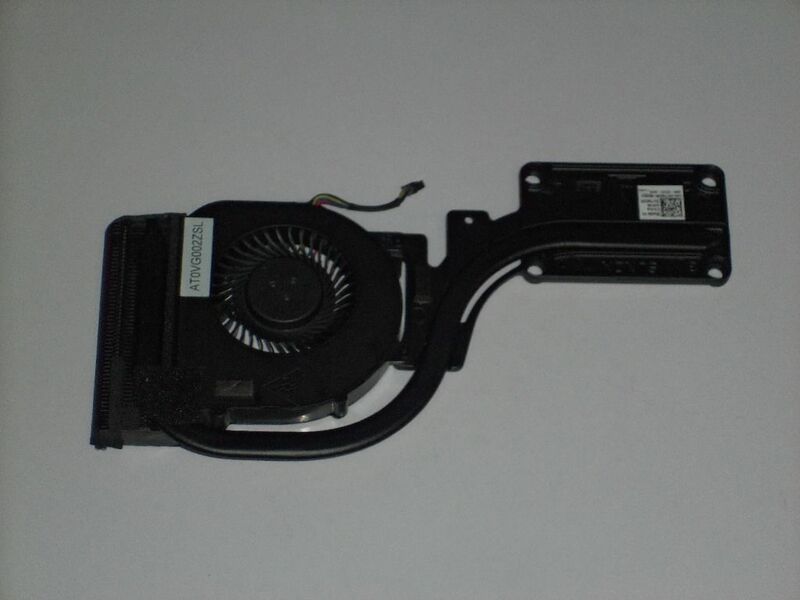 There's a dGPU-model E6440 heatsink on ebay-US offering international shipping if anybody wants to try: Dell Latitude E6440 Laptop CPU Nvdia Heatsink w Fan P N GXC1X 0GXC1X | eBay . Can somebody help/advise if a i7-4810MQ will work in the E6440 with dedicated graphics (the 4810MQ is cheaper than the 4800MQ at the moment). Yes, i7-4810MQ will install and work in a HD8690M dGPU E6440. The dGPU model coming with the better heatsink than the iGPU model as noted above. Only issue would be heat CPU/GPU related throttling with both under load. If running the i7-4810MQ with just the iGPU active then will be no problem. If wanting to max out the dGPU during gaming then you may consider using Throttlestop software to limit the max turbo on the CPU, even switching it off. The turbo can also be switched off by setting Processor Power Management -> Maximum to 99% in the Power profile. Thanks so much - it's really appreciated. If I just set the Processor Power Management to 99% will that be enough? I'm going to buy some decent CPU thermal paste which will probably help a bit. I'm a developer and also use the Adobe apps so I just want to get the most out of the machine that I can. Currently I have a E6430 with a i7-3740MQ, dedicated graphics, 16GB memory and Samsung 840 Pro 512GB SSD. I needed to buy a new machine for my son and the E6440 with 8GB, 180GB SSD, i5-4300M and dedicated graphics new was only $850 (£512). I'm happy to but new memory and processor and let my son have the E6430 and I'll take the E6440 which has better graphics and WWLAN (we'll just swap the SSD's). The 47W i7-quads have 10W higher max TDP than the factory specced dual-core 37W i5/i7. So if did install a 47W i7-quad, how would you decrease CPU consumption by 10W or more? 1. 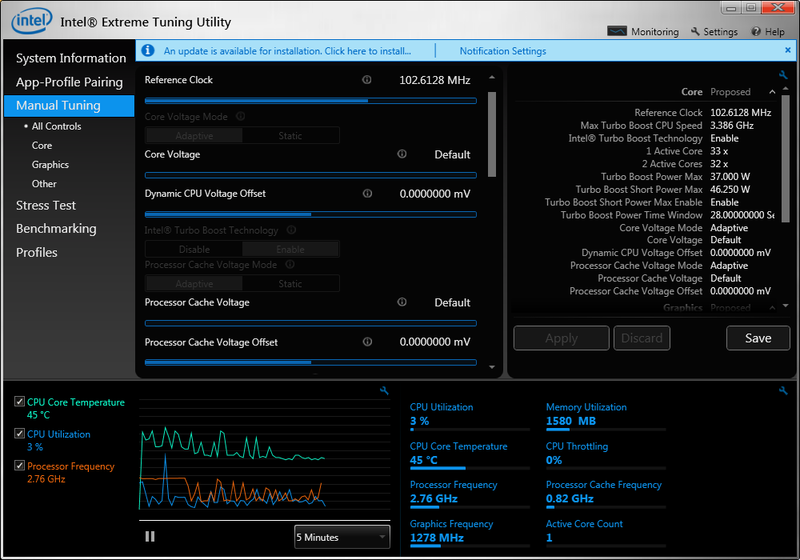 Disable the turbo mode using Windows Power Profile -> Processor Power Management, set Max CPU=99% . Based on above link we can estimate a x10 decrease in multiplier will decrease TDP by nearly 20W. 2. The other way is to use Throttlestop or XTU to apply a negative offset, undervolting the CPU. The aggressive -130mV offset applied in above link saw the maximum turbo multiplier's TDP decrease by just over 10W. Tuning the system by modifying both the above parameters would see a convergence point yielding highest performance at 37W TDP. The other alternative would be to just get a 37W i7-quad CPU like a i7-4702MQ or i7-4712MQ. The drawback there is less tuning capabilities. Keeping in mind that if you do not engage the dGPU then the 47W TDP i7-quad CPUs have additional TDP headroom to run higher multipliers. It already has a 1600x900 LCD, EC Slot, and AMD GPU, does that seem a good one for the price? Also, will the presence of the AMD GPU make problems for eGPU? Well, my E6440 with no dGPU has TOLUD=3.25GB. That gives enough room for an eGPU, iGPU + system devices. If the dGPU model also (likely) sets TOLUD, then the additional resources required by the dGPU would mean there wouldn't be enough 32-bit space to include a eGPU. The workaround then would be to either disable the dGPU to free up resources (via bios or Setup 1.30) or apply http://forum.techinferno.com/diy-e-gpu-projects/7476-%5Bguide%5D-dsdt-override-fix-error-12-a.html#post102517 . Good news is the dGPU model has the better heatsink for i7-quad upgradeability and would give you better gaming on the go. I've see the same spec on ebay-US go for under US$800. Worth keeping an eye there for units. Thanks - do I need to do both 1 and 2 from above or can I just do 1? What do you recommend? I have the i7-4810MQ in hand, as well as the additional memory and some decent thermal paste so I'm ready to go! Final question - if I take my existing hard drive out of my E6430 (once fully backed up) and put it into the new machine will it boot (Windows 8.1)? I appreciate I may need to reactivate some stuff. I would do testing using (2) Throttlestop as described at http://forum.techinferno.com/throttlestop-realtemp-discussion/6958-haswell-step-backwards-ivy-bridge-i-have-some-shocking-tdp-results.html#post95181 . There you can undervolt to bring temps down and do further reductions by 100Mhz (top multi, x38, x37, x36) if needed to get comfortable temps. That's gives more precision. Disabling turbo boost in (1) can see a x10 (1000Mhz) drop in performance. Besides, you can always revert to (1) if temps are an issue. It's also a good idea to disable turbo boost using (1) when running on battery to maximize battery life. Your E6430 HDD with Win8.1 will probably work in the E6440 since a lot of the older drivers work OK with the newer platform. Ensure the HDD interface (IDE, AHCI or RAID) in the E6440 bios matches the one on the E6430 bios. If they differ they you'll usually see a BSOD on startup. Does anyone know the battery compability ? Dell sells battery for the e6440 (and e6540) WT5WP but... also for e6420(/30) and e6520(/30) 2P2MJ where the compatibility with the e6440 is clearly indicated. So ... does both batteries work for the whole serie ? or only both for the e6440 and only the second fort the e6xx0, or only the first for the e6440 and the second for the e6x20 to e6x30 ? Well the upgrade went well although I'm getting a few BSOD which could be hard disk related and I've done some repairs on that. Please can you explain exactly what settings in Throttlestop I should be changing - exact instructions if poss?!? Also, how get I get Throttlestop to start at Windows start up. I've tried creating a shortcut in the correct directory but it's not picked up or started. So nearly there... thanks for all your help. I'm wondering then if the A.02 to A.07 upgrade is not such a good idea if wanting best i7-quad performance?? To help answer this, would you mind running Throttlestop, selecting TS-bench, hitting 1024M and observing the TDP value reported next to VID? I'm curious what's the highest number that you during the initial run, for say the first 10-20s. That is. whether you are seeing < 40W or > 40W. If > 40W then how great? If you wanted to take it a step further you could assemble the table like I did previously at http://forum.techinferno.com/throttlestop-realtemp-discussion/6958-haswell-step-backwards-ivy-bridge-i-have-some-shocking-tdp-results.html#post95181 . Going through that process would give you a first hand example of how to lower temps using Throttlestop; answering your question. OK... BIOS is A.07, how do you go about the downgrade if needed; just run the EXE? I'll use your guidance if this will be better for performance. Running the test as suggested I get a highest value of 36.5W - so that's <40W, the VID value was just under and the highest temp was 83. What sort of temperature does your system run at? Also, how do you apply the -130mV offset, just by setting the Multiplier lower? 30 Failed with BSOD at around 5% - eek! Currently running at multiplier of 25, 0.8845 with a temp of 6-8W (running around 41 - 48 degrees across all 8 cores). OK, so tried a re-install of Windows on a different hard disk and am still getting some BSOD's. Checking the memory at the moment and there doesn't seem to be any issues (thought it was worth a shot). The option for Processor Power Management is back with the re-install, but if it's set anything higher than 95% then I can't be in Windows more than a minute or two without a BSOD. I'm using ThrottleStop 7b and have worked out how to change and set the offset to -130mV and with this setting I've managed to have the machine on for a good few hours without a BSOD - progress at last. Also, managed to get ThrottleStop to start with Windows too. So, all I need to do (!) is work out the best setting for ThrotteStop and then I'm good. Should I be setting the TPD multiplier to a default value on the main ThrottleStop page (e.g. 32, 33, 34, 35 or 36) or just leave it unset, that's really the only question I have now? I've gone back to ThrottleStop 6 as 7 seems to unstable - maybe it's just me, I don;t seem t be having a lot of luck! Throttlestop 7 should be used for Haswell CPU support. The variables you can tweak to lower temps are the voltage offset in the TRL window and lowering the multiplier in the main window. A -130mV voltage offset is large and may be the reason for instability. Try -80mV and work up if you find it's stable. The higher the stable offset you can use, the higher you can set the multiplier. Apply a 4-core CPU benchmark like TS-bench to see well the system dissipates heat when under load and appropriately increase or decrease the highest multi. My latest TS-bench VID vs TDP results are iat http://forum.techinferno.com/throttlestop-realtemp-discussion/7548-help-dell-e6440-previously-tdp-throttled-i7-4700mq-~47w-now-40w-why.html#post103638 . In the case of your i7-4810QM, you can click TRL, select overclock and ramp up the 4-core multi up to x36 . However, TDP (47W) and cooling limits will see you too likely limited to ~x30 under 4-core CPU load. That is unless you have a very efficient CPU and the dGPU heatsink/fan, which may see you be able to soar higher. You can either control the max multi in Throttlestop to set your own comfortable temps or leave it unchecked and let the Intel turbo boost algorithm do it. What happens there is once the CPU hits near 90 degrees, it will throttle back the multiplier automatically in order to salvage the CPU, keeping temps below 97 degrees. FYI: while my results look pretty good, the temps are not so good. The upper end of the tests can only see the CPU run for a short time before it gets temperature throttled. I would need the dGPU heatsink and perhaps some fan control software to improve it substantially. Thanks Tech Inferno Fan - I'll go back to Throttlestop 7, I've also gone back to the A02 bios too (and not installed the ME FW yet). I'll try with -80mV first as you suggest but what should the core voltage be set to? I'll then run some tests myself and let you know how I get on.